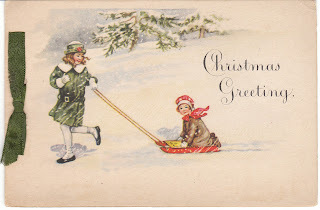 In honor of Free Shipping Friday, 12/17, I just wanted to send a reminder that I offer free shipping on over 1200 beautiful, frameable vintage cards in my store. They make great gifts! Christmas, Easter, Valentine's, postcards, dogs, cats, retro children - lots of sweet cards ready to gift, whether framed or on their own! Click here to visit Birdhouse Books - Free Shipping on Ephemera!